Members of the New Hampshire Fisher Cats front office spent Wednesday morning volunteering their services at the New Hampshire Food Bank in Manchester and the Londonderry Toys for Tots as a part of the club’s annual Day of Caring. The Fisher Cats front office also participated in the Salvation Army’s Adopt-a-Family program and contributed gifts to local family in need during the holidays. Half of the Fisher Cats staff headed to the New Hampshire Food Bank warehouse in Manchester where they assisted the Food Bank staff in sorting donated food items in preparation for delivery. The other half of the Fisher Cats staff visited the Londonderry Toys for Tots headquarters and helped with organizing donated toys and readying them for distribution. Earlier in the week, a local family participating in the Salvation Army’s Adopt-a-Family program visited Merchantsauto.com Stadium and received gifts including toys, clothes and Fisher Cats merchandise donated by each member of the Fisher Cats front office staff. Each month during the off-season, the Charleston RiverDogs close the office to complete a day of volunteer service with a local nonprofit organization. Since October, the RiverDogs have worked with Lowcountry Orphan Relief, Charleston Habitat for Humanity, and Feline Freedom Coalition. On December 17th, the RiverDogs staff spent the day volunteering with The Charleston Animal Society. The team met with Staci Bennett, the Director of Volunteer Programs and Events, to tour the facility and learn more about the work of CAS, before getting started. Throughout the morning, the RiverDogs staff assisted the CAS staff by washing windows, cleaning cages, preparing fresh litter boxes, helping with cat enrichment procedures, and exercising dogs. “It is always gives you a good feeling to help to improve the lives those less fortunate than ourselves. It is especially rewarding to help animals, that have no means of helping themselves, and you know will give a lifetime of love and affection to you in return,” commented Sarah Ward, RiverDogs Community Relations Director. The Charleston Animal Society is a non-profit, open-admissions animal shelter serving Charleston County, where no animal is ever turned away. The mission of the organization is to promote responsible guardianship of domestic animals and advocate the compassionate treatment of all animals. In order to accomplish this mission, CAS strives to: promote temporary sanctuary to lost, abandoned, or abused domestic animals; promote adoption; provide medical care to indigent pets; eliminate overpopulation of animals with aggressive spay/neuter and education programs; provide education about responsible per guardianship; reunite lost pets and their owners; and reduce cruelty through stronger ordinances, investigations, partnerships, and education. For more information on how to donate, volunteer, or adopt a pet, please visit www.charlestonanimalsociety.org. Next month, the Charleston RiverDogs staff will spend a day beautifying their own neighborhood by planting bulbs with the Charleston Parks Conservancy and the Park Angels at Brittlebank Park. The Rome Braves and Floyd County Police Department presented a check Tuesday December 21st to the Boys & Girls Club of Rome for $10,648.00 on the front plaza at State Mutual Stadium. The funds for this donation were raised through the 2nd Annual Celebrity Shootout Golf Tournament hosted by the Rome Braves and the Floyd County Police Department. This year’s celebrities were former Rome Braves managers Rocket Wheeler and Randy Ingle as well as Atlanta Braves 3rd base coach Brian Snitker and former Rome Braves coach Bobby Moore. A local autism support group is the latest recipient of a $1,000 grant from the Gwinnett Braves. 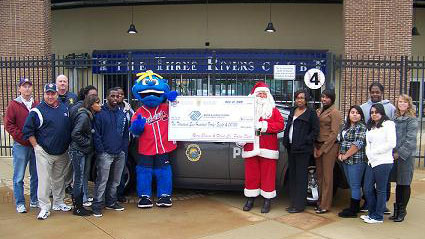 On Monday, the G-Braves announced that Spectrum Autism Support Group, Inc. would be awarded its December grant. The money will be used to support the organization’s social skills program for children ages 4 to 22 with autism spectrum disorders. The Suwanee-based organization was founded in 1998 and provides support, education and resources encompassing the entire spectrum of autistic disorders in Gwinnett and surrounding areas. At its monthly meetings, the social skills program allows 50 to 80 children to enjoy interactive and fun activities that focus on social lessons. Hundreds of cars lined Ga. Highway 20 in Lawrenceville on Saturday afternoon, waiting for their turn in the parking lot of Coolray Field. Heartfelt cries of “God bless you” and “Merry Christmas” poured from vehicles as unemployed families by the thousands patiently and happily filed through, volunteers from 12Stone Church and a number of partners doling out turkeys, hams and groceries to those in need this holiday season. After police officers directed folks into the lot, a stone’s throw from the Gwinnett Braves’ stadium, volunteers-turned-traffic-managers orchestrated what turned out to be a smoothly run operation. Cars were organized into four separate lanes, with pallets full of goodies stacked intermittently in between. An estimated 250 volunteers cheerfully took requests from waiting recipients. All told, 12Stone distributed 2,500 meals Saturday. 12Stone partnered with HoneyBaked Ham Corp., Kroger, Signature Foods and the G-Braves to provide “a meal and more.” Each family went home with a HoneyBaked ham or turkey, a week’s worth of groceries and a voucher for four tickets to a 2011 Gwinnett Braves game. The church had already given 3,000 packages to unemployed members, friends and neighbors of the congregation. In all, the 5,500 packages distributed totaled more than $1 million in goods and services. As testament to the tough economic times, cars lined up at nearby gas station hours before the giveaway scheduled for 1 p.m., jockeying to make sure their family got a real Christmas dinner. This article by Tyler Estep originally appeared in the Gwinnett Daily Post on December 18, 2010. Parney the Elf, Santa Claus, the United States Marine Corps and the Richmond Flying Squirrels collected nearly 17 bins full of new, unwrapped toys during the 2nd Annual Holiday Party at The Diamond on Saturday. 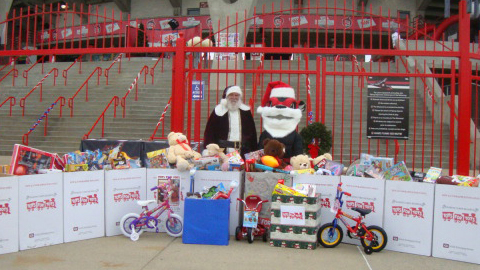 Many gracious fans braved the elements as the team collected more than double the amount of toys (eight bins) that the Inaugural Holiday Party netted in 2009. During the event, party-goers visited Santa Claus and had their pictures taken by Real Life Studios, enjoyed Christmas crafts, warmed up with hot chocolate and Christmas cookies and enjoyed a baseball-themed raffle. The Richmond Flying Squirrels‘ Score an “A” Free Ticket Program presented by Union First Market Bank was a huge success in its inaugural year, and the program will be available once again during the Flying Squirrels’ 2011 season. The value of tickets redeemed during the 2010 season was over $18,000. 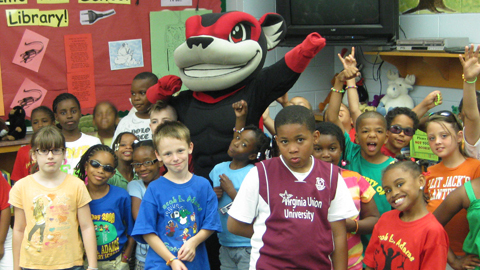 Every “A” on a student’s current K-12 report card during the third and fourth marking periods earned them a FREE General Admission ticket to a Richmond Flying Squirrels home game. Each “A” was good for one ticket per game–for example, if a student earned 8 A’s they would receive 8 General Admission tickets to 8 different games. Students cashed in on nearly $18,000 worth of tickets in 2010.